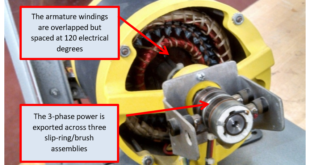 This article covers Characteristics of several Single Phase Electric Motors such as Shade Pole Motor, Split-Phase, and Capacitor Start-Induction Run (CSIR) Motors, Permanent Split Capacitor (PSC) and Capacitor Start-Capacitor Run (CSR) Motors, and Brushless D.C Motors in detail. Shaded Pole motors exhibit low starting and operating torque; they are suitable for small air moving devices (fans and blowers). SP motors are identified by the presence of heavy gauge copper rings called shading coils. A shading coil creates a weak magnetic field that is out of phase with the main winding, to create a rotating magnetic field. Since these motors have no mechanism to disengage the shading coil, the shading coil’s magnetic field opposes the main magnetic field during the duty cycle. Some SP motors are “impedance protected”, meaning that they can draw Locked Rotor Amps (LRA) for weeks without burning up. Power ratings range from a few watts to ¼ horsepower. SP motors have low operating efficiencies – 30 to 33% – due to the opposing magnetic field created in the shading coil. SP motors require no starting components such as: capacitors, current relays, potential relays or PTC devices. Both of these motors share similar electrical characteristics and exhibit moderate running efficiencies – 45% to 50%. Split Phase motors have moderate starting torque and do not employ the use of start capacitors to create a rotating magnetic field. Capacitor Start-Induction Run motors produce high starting torques because they use start capacitors to create a rotating magnetic field. Both motors have start windings and run windings. Both motors have three electrical connections: Common (C), Start (S) and Run (R). Mathematically, the resistance in ohms between Common and Run plus the resistance between Common and Start equals the resistance between Start and Run. Each of these motors uses an auxiliary device such as a current relay, a centrifugal switch or PTC device to disengage the start winding after the rotor comes up to between 75% and 80% of the rated RPM. Split Phase motors are used to power: centrifugal pumps, evaporative cooler blowers, residential refrigerator compressors, and older furnace blowers. CSIR motors are used to power small commercial refrigerator/freezer compressors and sometimes: larger centrifugal pumps and evaporative cooler blowers. Both Split Phase and CSIR motors are commonly less than one horsepower. Both of these motors share similar electrical characteristics and exhibit relatively high running efficiencies (around 60%). Both of these motors use run capacitors to achieve high efficiency by bringing voltage and current into phase with each other. PSC motors have moderate starting torque and do not employ the use of start capacitors to create a rotating magnetic field. CSR motors have high starting torque because they use start capacitors to create a rotating magnetic field. Both motors have auxiliary windings which are commonly called “start windings”. Auxiliary windings remain energized throughout the duty cycle and are connected in series with a run capacitor. Mathematically, the resistance, in ohms, between Common and Run plus the resistance between Common and Start, equals the resistance between Start and Run. CSR motors use an auxiliary device called a potential relay, to disengage the start capacitor after the rotor comes up to between 75% and 80% of the rated RPM. Once a CSR motor is operating at its rated RPM, it is functioning as a PSC motor. PSC motors are used to power: blowers in residential air handlers, small air conditioning compressors, and residential and small commercial condenser fans. CSR motors are used to power: refrigeration and air conditioning compressors in systems that use expansion valves. Both PSC and CSR motors can be up to 5 horsepower (in air conditioning compressors). ECM’s are the most efficient (80% to 82%) single phase motors used in the HVAC&R industry. ECM’s do not use industry standard Start or Run capacitors and do not have separate Start and Run windings. ECM’s have powerful permanent magnets attached to the rotor and 18 bundles of wire (windings) in the stator. When ECM’s are energized, they do not draw Locked Rotor Amps (LRA). 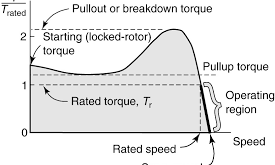 Instead, the rotor RPM is ramped up steadily and the amperage increases accordingly, greatly reducing heat production in the windings.